Welsh walker Bethan Davies says the hard work has paid off after qualifying for the World Championships in London and setting new three personal bests in a week. Davies, 26, followed up sealing her World Championship place in the 20km by setting two new British bests in the mile and 5km event. The Cardiff walker won the 5km at the British Championships in Birmingham. "It's been a very good week, all the hard work has paid off," said Davies. 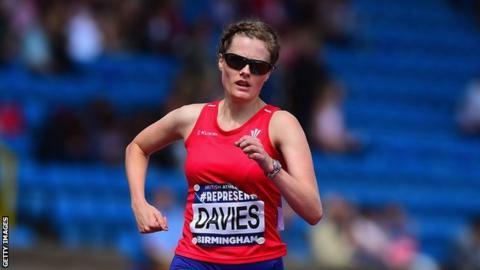 Davies competed in three events in seven days which began with achieving the London 2017 qualification time when she finished in a Welsh record 93:04 behind Gemma Bridge. Davies will be joined by Bridge and Tom Bosworth and Callum Wilkinson at the World Championships next month in London (August 4-13). "It is unbelievable," said Davies. "I probably when I was younger never expected to get to this level of sport. "It hasn't sunk in yet and when I get there I will probably have to take a few moments. "It's absolutely fantastic to be on the same stage as such big names. "This will be the biggest competition I have ever been to and it will be a big step up." Davies will now take part in a three-week altitude camp in Livigno, Italy and St. Moritz, Switzerland and attend a British Athletics holding camp in Paris before her event on 13 August on the Mall. "It will mean so much because the first chance I saw race walking was at London 2012," said Davies. "To go from a spectator to the start line alongside the girls who have inspired me and are now my friends and rivals will be amazing. "It is going be a home event where all my friends and family will be watching. "Growing up, the thing I remember was watching the London Marathon finishing on the Mall. "To be there and doing my sport at the highest level is going to be amazing." Davies believes walking is receiving a higher public profile. "From when I started it (walking) has grown," said Davies. "We are getting more attention which has been helped by Tom Bosworth coming sixth in the Olympics last year which has raised the sport's profile. "Race walking is a really good way to get people drawn into athletics."